Spring is slowly arriving here in our neck of the woods. There are a few signs around, some subtle and some pretty obvious. 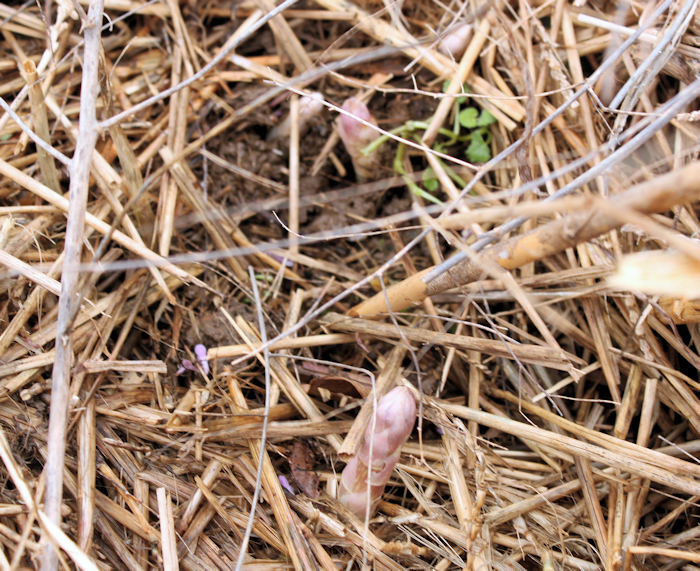 For instance, I almost overlooked the little snowdrops blooming out in the yard. Some previous resident must have planted them, and they have so far survived mowing and foot traffic in their present location. There are a few tulip leaves shooting up in a bed out by the driveway. As soon as they came up, they were nipped back by the resident deer herd. They’ll eat the tulip flower buds as soon as they come up too, so there’s no reason to expect to see tulips unless we start spraying repellent. These days I rarely say the word ‘deer’ without adding a flavorful adjective to go along with it. I would be happy to share our deer with anyone who would like some wildlife in their backyard. Anyone interested? I’ll even arrange shipping! On a happier note, the hard working ‘ladies’ of Happy Acres have been taking advantage of warmer weather to do a little foraging. Right now there’s not a lot of pollen or nectar sources, but they managed to find some blooming Asian greens and arugula in the greenhouse. I need to pull both of them and replant the beds, but I don’t have the heart to do it right now. How would you like if you were cooped up all winter, and as soon as you could get out and find something to eat, it was snatched right out of your mouth? If you look closely in the below photo, you can see the yellow pollen stored in the basket on her rear leg. I also took advantage of recent warm weather to work outside, and inside the greenhouse. I planted a couple of mini salad boxes this weekend, one with lettuce and one with arugula (to replace the overwintered plants that are flowering). I have more salad green seedlings that need to find a home soon in the greenhouse and cold frame beds. There’s no sign of asparagus coming up yet. Last year it surprised us by coming up about 3 weeks earlier than usual. I don’t think that will happen again this year, but anything is possible. And last year the bluebirds had finished building their first nest by March 12th, with eggs laid about a week later. This year they are hanging around the nest box already, which is a good sign. And there’s a few ceremonial sprigs of grass in the bottom. Only time will tell when they decide that it’s time to lay those eggs. So it looks like spring is coming along, slowly but surely. Which is not a bad thing at all. I am in no rush for summer, or for time to pass any faster than it is already! This entry was posted in Gardening, Weather and tagged asparagus, bees, bluebirds, salad boxes, spring. Bookmark the permalink. Spring is definitely around the corner! There are some snowdrops and crocuses blooming around here. My problem is with the bunnies. They eat the crocuses as soon as they pop up. I guess they missed a few! We had snow Friday and a little more Saturday… about 6 inches, but it’s mostly melted in the yard now. I have seen the spikes of Daffodils poking up in the yard, so I know Spring is coming! No evidence of elk as yet, but bunnies aplenty! I can’t wait to get out in the yard and at least do a little spring cleaning, although it will be awhile before I can put out any plants. Up here in the high country, June 15 is about the date when frost danger is past, so growing season is limited. But I can sure have fun getting ready before then! Meanwhile, our birds have wintered well… I keep the feeding stations filled, and have a large population visiting daily, with pines nearby for them to nest in. We’re all ready to enjoy the growing season! I’m so glad we are having a more normal winter. The early spring last year was hard on the plants. So nice to see those first signs of spring after a snowy winter. We have no snow along the coast of southern California, but we do have snowdrops in our yard. They are a bit past peak bloom, and the paperwhites narcissus are already finished. Our Panamint nectarine is in full bloom, but the Snow Queen nectarine hasnt started yet.